Vantage Pro2 - The Best Ever Davis Weather Station? There are a lot of good home weather stations around, at prices to suit all budgets, although, like almost everything, better equipment costs more. Most major brands are reviewed in these pages - you can find them in the menu bar on the left. But someone has to set the standard, and in the case of home weather stations it is Davis Instruments. First it was the Vantage Pro, recently surpassed by the completely redesigned Vantage Pro2. And in late 2009, Davis introduced the scaled down version of the Vantage Pro2, the Vantage Vue. It is probably too early to judge just how good the Vantage Vue is - we really need to see how it performs over a few months to make sure that the Davis reliability has been transferred to the new model. But basically it is just a trimmed down version of the Vantage Pro 2 with a new simplified sensor module, a few less alarms, and no connections for some of the more specialized sensors such as leaf wetness and soil moisture. These modifications reduce the listed price by $200 to US$395, but the specifications, precision and frequency of data updates are identical to the Vantage Pro2, and still surpassing all other home weather stations anywhere near this price level. I realize that even with commonly available price reductions, which bring the prices of the Vantage Pro2 and Vantage Vue back to the low 400s and 300s respectively, this is still quite a big spend if you are just starting to observe your local weather. There are plenty of good weather stations around for much less than this, and you could check out the ranges offered by La Crosse and Oregon, amongst others. Even Davis has a less expensive weather station in the Weather Wizard III, a cabled instrument which does most things and shouldn't cost you any more than US$200.00. 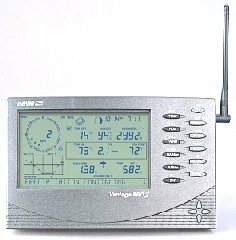 You can find out all about the Davis Vantage Pro2 and other products at the Davis Weather Station site. While you are there, you might have a look at some technical comparisons with other brands. For a more accessible summary of this remarkable weather station's performance, specifications, features and benefits, visit the Davis Vantage Pro2 page at my related site Home Weather Station Reviews. But let's get back to the Vantage weather stations. The Vantage Vue is described elsewhere, but keep in mind that it is just a slightly simplified version of the Vantage Pro2. So almost everything you read in the following paragraphs will apply to both models. Perhaps the easiest way to evaluate the Vantage instruments is to consider whether you may want more than the standard weather information. If you are happy with temperature, humidity, air pressure, rainfall, wind direction and wind speed then the Vantage Vue will be an excellent choice. If you need to know more about ultraviolet radiation, soil moisture and temperature, leaf wetness and so on, or you need to improve your temperature data by shielding your sensor from the effects of direct sunlight, then the Vantage Pro2 is the better choice. It particularly suits horticultural businesses, turf farms, and people with large gardens, particularly if automatic irrigation is installed. One final word before I return to the Vantage Pro2. It was released in November 2004, and it differs from its predecessor, the Vantage Pro, mostly in the way it handles communication between the remotes and the receiver. The two models are not compatible, and the original Vantage Pro is no longer available from the manufacturer. And if you are considering buying on eBay, make sure you are bidding on a Vantage Pro2, with model numbers 6152 or higher. So, why is it that the Vantage Pro2 sets the standards for home weather stations? I guess we all tend to be impressed with the new, and in this case we are dealing with the first upgrade of an already highly regarded weather station with a top US and International track record. It is also the first Davis Weather Station to use a new radio technology which extends the clear range to 1000 feet, or over 300 m. And Davis has also been able to hold the price of the standard model to $595.00, around the level of similar weather stations from their competitors. What's So Good About the Vantage Pro2? Firstly, like all good weather stations, the basic model, the Vantage Pro2 6152 records a full suite of temperature, humidity, air pressure, wind strength and direction, and rainfall data. Other sensors are also available, or you could move up to the Vantage Pro2 Plus, which includes a fan cooled cover over the temperature sensor to ensure more accurate data. Next, it is a wireless weather station, with a clear reception range of 1000ft (over 300m). The transmission system is new and there are no government restrictions on its use. This means that the most rapidly changing data, wind speed, is updated every 2.5 seconds - an excellent feature, meaning you won't miss those peak wind gusts. Overall, this extensive signal range means far more options for you in sensor placement and receiver location. But for those of you who prefer a more direct transfer of data, a cable version of the Vantage Pro2 is available (model number 6152C), and at a slightly reduced price. Thirdly, your temperature sensor is shielded so your readings are not affected by direct heat from the sun. You can further stabilise your temperature and humidity data by upgrading to the 6153 Vantage Pro2 which includes a fan to mimimize any effects of direct sunlight on the shield. Fourthly it is easy to install. A purpose built stand is available at a small extra cost. The Vantage Pro2 comes with a full selection of programmable warnings - no more damage to the garden from unexpected storms, strong winds or frost. Wind chill and heat index functions are also included, plus much more. The Vantage Pro2 also contains an easily readable charting facility, where you can review changing weather patterns over the last few hours, or days, or months, for almost any variable. It is easy to link to your computer. Davis can provide its recommended software, and it is also fully compatible with most weather software programs, including some which are free. You've probably noticed that there are a number of private weather stations on the net, reporting online data just like you will be seeing on your computer screen. There's absolutely nothing stopping you from doing the same - in fact a Davis Weather Station is used by more private weather stations than any other brand. Even better, you will have found a network of people with similar interests to yourself, scattered over the country, even the world. Near the beginning of this article, I mentioned looking for your Davis Weather Station on eBay. Ebay provides a reliable and cheap means of obtaining home weather stations, including Davis. As with all ebay transactions, some caution is required, but I have noticed that there are at least three sellers with over 1000 transactions and a 100% satisfaction record. Many current sellers appear to be accredited Davis resellers, which means that all the manufacturer's guarantees and back up service apply. At least two of these sellers have been selling Davis weather stations for over three years on ebay. So with reasonable diligence, I see no reason why you couldn't consider ebay as a source for your weather station. Obviously it would be a good idea to check prices elsewhere and set your maximum bid accordingly, and make sure that the seller is an accredited Davis reseller. Ignore the "Buy Now" prices - they are generally the Minimum Authorised Price set by Davis Instruments and almost all retailers will give you a substantial discount. You can see what is available on eBay right now towards the end of this page. Another good source of Davis weather stations is Amazon . One further point - radio regulations vary from country to country, and weather stations have to comply. If you are not a US citizen but are thinking of buying a weatherstation through eBay US, or any other vendor, check thatthe model you are interested in will work where you live, and what guarantee is available. The manufacturer may be the best place to go. A price of $535.00, even with good retail discounts, may be more than many people are happy to part with. And while I believe the Davis Vantage Pro2 to be the best reasonably priced weather station available at the moment, there are a number of other very nice models made by La Crosse Technology and Oregon Scientific which I have reviewed elsewhere. Many of these are available at prices around $200.00 to $300.00. I am most impressed with the Vantage Pro2, at the head of the Davis Weather Station range, but I know that just as much enjoyment in the rapidly changing moods of our weather can be gained from less costly equipment, even if the range, resolution and update period mightn't be quite as good. If you are looking for something a little more robust than a Davis Weather Station, particularly if you live near the sea where salt may be a problem, check out Rainwise and WeatherHawk Weather Stations. And no matter what home weather station you buy or own, its performance is only as good as the way it is set up. The article on Setting Up will help you identify just how to get the best out of your system around your home. You will also find that a little extra work at the beginning in weatherproofing moving parts, battery compartments and cable connections will pay off big time in minimising or preventing problems in data transmission. The article on Troubleshooting will help. Whatever your choice, you will have entered the exciting world of weather observation and recording. These listings are the best and easiest way to find Davis Home Weather Stations and related articles from eBay. This includes the very popular Davis Vantage Pro2, usually obtainable new and under warranty at very competitive prices. All Weather Stations in the following lists are available right now. See something you like? Then move fast and place your bid. If not, bookmark this page or the Home Weather Station Auction Index page, because if what you're after isn't here now, it almost certainly will be later. When you click on a link below you will be taken straight to an eBay page showing that item. All items will open in a new window, making it super easy for you to check any Davis Home Weather Station that interests you. I hope you find exactly what you need, at a super price. This link will take you back to the Home Weather Station Auction Index. * all articles on auction courtesy of Ebay ** links open a new window at Ebay with product details. *Product links and pricing. The products I mention are, in my opinion, the best of the range in each category. But this doesn't mean they are just what you are looking for, and it is always worth following the link to the manufacturer's page. But don't buy from there - in almost all cases much better prices are available from both shopfront and internet based retailers. At all times eBay and Amazon are worth checking out, and you will notice many of the links go to Amazon. Amazon has built a very sound reputation for customer service, given the huge amount of business that passes through their website, and many products are accompanied by clear descriptions, alternatives, and reviews from customers. These can be very helpful, and I shop at Amazon myself. But prices can change very quickly there, so if you have made up your mind on a product and you see a good price there, grab it before it goes. Where possible, I provide links to other retailers where their prices are competitive. Some may be better than they seem if the prices include delivery and, where needed, batteries - check the terms they offer. Finally, I stand to make small commissions on some of the products I recommend. A lot of work goes into building and maintaining a site like this, and I am not ashamed if I recoup some of the costs, and even make a little money on top. That being said, I will and do recommend sellers where I will not make anything for myself. One of these is Ambient Weather, a useful retail site with good supporting information. But if you visit there, don't forget to come back!